Join my VIRTUAL Tabata Bootcamp! ONLY $29.99 for the full 8 weeks! Daily 6-minute workouts to start your day with – Better than coffee; you’ll boost your metabolism and send your energy levels through the roof! 3 times a week 30-minute workouts – Body weight strength training won’t bulk you up but it will help you get stronger and slim down. Optional 60-minute cardio workout to do whenever the mood strikes! For clients participating in my Summer Fitness Challenge, any completed 30-minute and 60-minute videos will count as a class attendance! Remember, it’s only $29.99 for the full 8-week session! 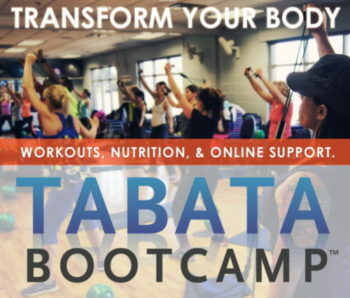 You’ll pay me $20, and $9.99 to sign up with Tabata Bootcamps (if you aren’t already a member). You do absolutely need either a resistance band or tube. You can use one you already have, but it’s easiest to use a figure-8 tube, and you can buy one from me for $15. The other “toys” (Gliding Discs, Bender Ball and Rope-Less Jump-Ropes) are optional, and only used rarely in this online bootcamp. You can get a full set of all 4 toys in a canvas Fitness with Rachel tote for $50, or individually the toys are $15 each.